As you found more villages, it becomes critically important to give them a specialized focus – learn about defensive, offensive and support villages, and start growing your own “hammer”. This post is the final part of a series of guides intended to help beginners discover the immense world of Kingdoms and massively multiplayer strategy. For this series, we assume you’ve completed the tutorial and have chosen the role of governor. In the previous chapter, you learned how settling more villages works. Now, it’s all about how to put these villages to best use. This is the last and longest chapter of the beginner’s guide. It will provide a glimpse at the real depth and scope of the game, and if you’re a beginner, I highly recommend you read through the earlier chapters before tackling this section. There are military units more suited for offense and units better adapted for defense. So far, so simple. A very important difference, though, is that an attacking force always fights on its own, while defensive forces of various origins can gather at a location as long as supplies allow and fight together in defense. This means, while a defender can have a number of small forces spread over multiple villages and use each village’s barracks and stables to churn out additional troops, an offensive army needs to originate from a single village and be grown as large as humanly possible. Two small attacks are less effective than one big one. These humongous offensive armies that come from a single village are called “hammers” by the Kingdoms community. To build a hammer, a player concentrates resources on a single village – usually the capital – and keeps the barracks, stables, and workshop there churning out troops around the clock. These hammers form the offensive capabilities of a kingdom – when the time comes for the final battle, kingdoms will pound each other with their accumulated hammers. In light of this, players typically specialize their villages in the long term. By the late game, seasoned players may have up to 15 villages. Village specialization allows you to optimize resource investment. Remember that villages merely represent infrastructure, and our primary goal is to grow our military. Research in Kingdoms is not global to your avatar – you need to research and upgrade units for each village individually as well as unlock buildings. This means if we didn’t specialize, we’d have to research the same stuff in every village again and again, thereby wasting resources on infrastructure instead of building units with them to prepare for war. That’s why we try to build villages that fulfill an important role, but get away with as little investment as possible. When we specialize, we have to build and research less. Village where you can create a “hammer” army. Only the offensive unit types used are researched and upgraded. A village close to the capital village with a hammer specialized in taking out robber hideouts (lots of quick-to-train infantry and a single ram to be able to besiege them for fewer losses). This is important for both defensive and offensive governors. These are villages that train lots of scouts to be able to punch through any resistance when in need of intel. These are villages producing and storing lots of crop; they send their crop to other villages as needed, for example to a hammer village or a village with a gathering defensive force. Of course, these villages will also have a surplus of other resources sooner or later. They have no troop production of their own and specialize in storing, hiding and sending resources off to other villages. Defensive villages only produce defensive units, until they consume most of their own crop supply. At this point, it can start sending off resources to hammer villages (or wherever there is a demand for resources). These are villages producing resources, but not much crop. They have their own offensive force for raiding, which uses up much (but not all) of their crop. Production villages with a raiding force are meant to grab resources from inactive players by sending large numbers of small forces using the farm list feature. The forces of a raiding village will not be able to attack a stronger player, but instead depend on a hammer to clear the target of enemy troops before they can start farming. 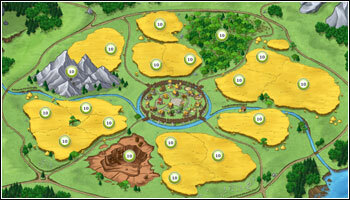 You should mix village types depending on your play-style and activity level as well as your role in your kingdom. If you are less active, prefer to play as a defender, and have a strong kingdom with some offensive players, you can simply build your capital itself into a robber hammer, supply it from lots of defensive villages, and assist your kingdom in this way. You could also add a scout village and share the reports with your kingdom as a spymaster. The more active and aggressive you feel, the more raid villages you’ll establish and later grow into hammers, preserving one primary hammer for the World Wonder battle of the endgame. You can then use them to raid, smite, and farm. In this case, you may want to supply them from dedicated support villages. However, even very strong players usually struggle to feed more than one hammer; two tends to be the upper limit. There are rare settling locations with 15 crop fields, but less of the other resources. These locations are considered highly valuable. This is because you gain huge production bonuses by crop-bonus oases in these villages – instead of the percentage bonus just applying to six or nine crop fields; 15 fields that benefit from the bonus naturally give a significant production advantage. A 15-cropper can be tremendously powerful, but only if you can defend and maintain it! What’s more, the crop-bonus buildings (the Mill and Bakery) are highly efficient in these villages, and you don’t need to build a Sawmill, Brickyard or Foundry, thereby saving resources and making space for other buildings. Experienced players will always seek to move their capital village to a 15-cropper, since the capital village allows for resource fields to be leveled up without limit. The income and size of the oasis bonus can thus be increased even more! These 15-croppers are then used as a parking lot for a player’s hammer to avoid the logistical hassle of transporting huge amounts of crop around for supply. It’s important to note that the hammer stationed there doesn’t need to be created there – a nearby village can just as well send its troops there for supply, saving the need to build a large troop-training infrastructure in the 15-cropper, and allowing for more warehouses to store the income and perform mass-resource exchange using the NPC trader. 15-croppers are usually highly sought-after, so as an aspiring player, you might not want to grab the best place on your first game – you’d just be painting a big target on yourself. More experienced players will likely take it from you sooner or later. While you’re new to the game, you should communicate with your kingdom. Ask your king and dukes which locations you could and should settle on, and which role you should fulfill in the kingdom. Having a strong kingdom back you without a 15-cropper is still infinitely more effective than claiming the best 15-cropper without any kingdom support. This is the most important part of picking your battles. If you want to grow militarily, you’ll need to preserve your forces as well as possible. This applies especially to any hammers you’re building. While having a player from another time zone sitting your account in your absence would be highly preferable, for most players that isn’t a viable option. So, you need to find a way to be able to step back from your account for a while and still be relatively safe that your troops won’t get obliterated in the meantime. A good strategy is to plan your online times and find an inactive player (gray village) or oasis across the map that is just far enough away so that your forces will return from a raid exactly when you come back online next. When you’re building a hammer, your crop production will enter into the negative, so your hammer village should contain enough granaries to be able to hold a few hours’ worth of crop. You should also set up trade routes from your support villages to deliver timely crop batches over the course of the night. To avoid enemies stealing the crop and starving your troops, kingdoms may also summon the defensive players of the realm to place all their defensive forces in the kingdom’s hammer village(s) and keep them supplied for the night. The most important part of any attack is having intel on what an enemy is sending at you. While taking a look at the enemies’ villages may help a little in judging the incoming forces, most of the time you won’t know how many troops the enemy has exactly. Also, pitting your kingdom’s defenders against attackers is not tactically advantageous most of the time, since both forces simply do what they’re best at in this case. It is infinitely better to pick a battle where only your force does what it is best at, while the enemy feels like a fish out of water – that is, catch their offensive troops on the defense. Counterattacking is the best defense against any dangerous and persistent attacker, followed by a superior number of defenders. Ideally, you’d always let the enemy run into an empty village without any troops or resources to destroy first. Not only does your enemy not gain anything, but you’ll also know the forces they have by looking at the combat report. You can either counterattack or tell your kingdom’s defenders the size and composition of the army they’ll likely face next time, if the same player sends an attack. A key exception are attacks that involve siege engines, such as catapults. Since these are incredibly slow, it’s easy to discern an attack involving siege engines from one that doesn’t. These attacks will cost you no matter if you’ve emptied the village beforehand. But even if an attack involves siege engines and your hammer village is targeted, the hammer is still way more valuable than any buildings that could be destroyed by the attack, so it should be your top priority to keep your hammer out of danger. That is unless your kingdom’s defenders are mostly online and have a lot of troops to waste. A coordinated defense by a dozen players is generally always superior to what your enemies can field. The basic idea is to judge what the risk of an incoming attack is the best you can, and also whether defending can provide you an advantage. Defending doesn’t mean having troops standing around in your villages, waiting to be slaughtered. A good defense is a coordinated, well-planned military operation that costs your enemies dearly, just like any attack. And just like an attack, preserving your troops, gathering intelligence, and planning are prerequisites for successful defensive action. Defense is not for the idle – leave your defensive troops just standing around in face of an unknown force and they’re destined to get wiped out. Always evade at least the first attack to preserve your forces and gain intelligence on your enemy. Coordinate with your king and summon the kingdom’s defenders in large numbers if an attack threatens highly valuable assets. Counterattacking is the best defense, since that will cripple your enemies’ ability to continue what they’re doing. This chapter concludes our eight-chapter beginner’s guide to Kingdoms. We hope that you’ve gained a little glimpse of what the game has to offer you – there’s much more, but applying the lessons in these chapters should get you started and likely accepted into a good kingdom as a rapidly growing, active player.